The Juno Mine was a small mine that operated south of the Nova Scotia Mine. The site is adjacent to the Peterson Lake road. In the early 1990s, a small headframe stood on this site, and there was a small waste rock pile. It was a site that was in many ways typical of the numerous smaller mines that once operated in the Cobalt area. In recent years, reclamation work has been done on the site to address mine hazards concerns associated with the site. The headframe was torn down, and the shafts of site were capped. 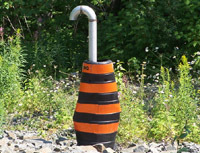 Pipes were installed in the concrete caps to prevent any build-up of gases under the caps, and locations of these pipes are clearly marked to prevent any damage from the movement of vehicles on site. Waste rock on site has been re-contoured somewhat, though some waste rock covers the concrete caps, preventing future inspection of the condition of the caps. Surprisingly, the debris from the destruction of the headframe has been left on site, posing a potential physical hazard to anyone visiting the site. 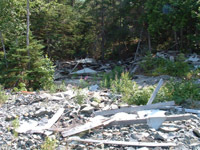 In addition, it is possible that this debris may contain asbestos, particularly from the siding material used in the headframe, since there appears to be some sort of fibreboard type material on site. 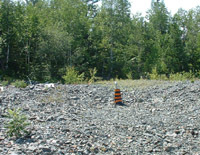 Asbestos has been found in the soils around some other sites in the area, notably the Nipissing high grade mill. It is doubtful, however, that the wood from the headframe would be contaminated with arsenic, as may be a concern at some other sites, since this wood was not exposed to arsenic bearing waters as was wood on some of the tailings deposits in the area, and around some of the mill foundations.